By Kalyra Makepeace | November 13, 2018 | This post may contain affiliate links, which means we may receive a small commission, at no cost to you, if you make a purchase through a link. Read our Disclosure. In my last post about our trip to Universal Orlando Resort I shared with you the awesome day we had at Universal’s Volcano Bay. For the next two days, we moved between Islands of Adventure and Universal Studios and had the time of my life. We had the 3 day multi park pass so we could move between the two parks easily. I highly recommend having that pass. 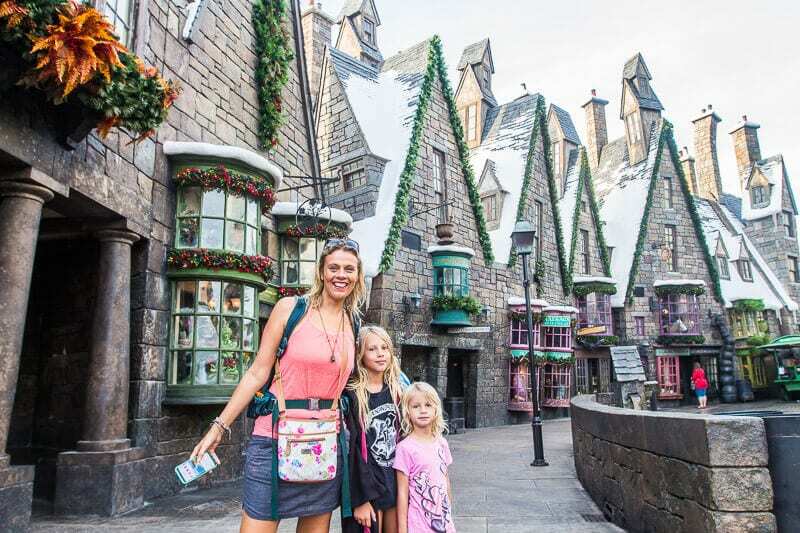 It will make your day so much better, especially for experience The Wizarding World of Harry Potter. 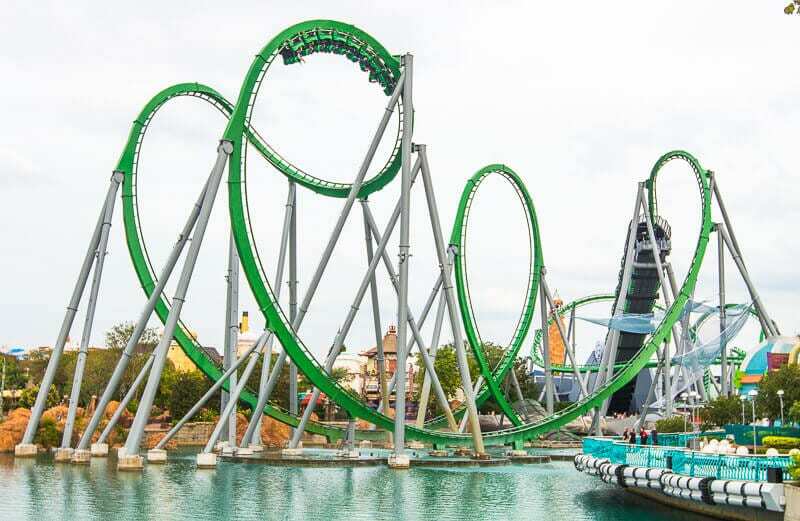 Islands of Adventure is one of two theme parks at Universal Orlando Resort and is known for it’s thrill rides. It has seven individually themed islands, each with its own attractions, restaurants and shops. All the rides and attractions are based after books, Marvel comics, or mythology. Islands of Adventure was epic. 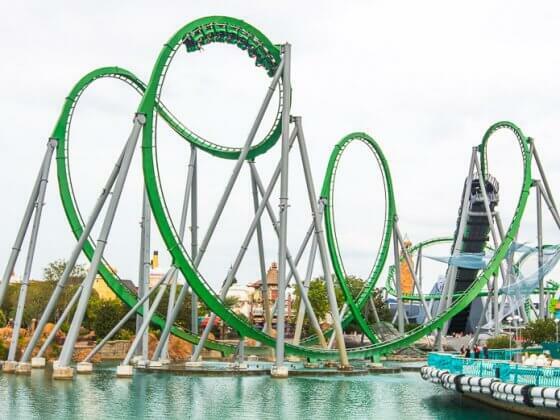 Not only did this park have the main Harry Potter section, but it also had one of the BEST rides ever, The Incredible Hulk. 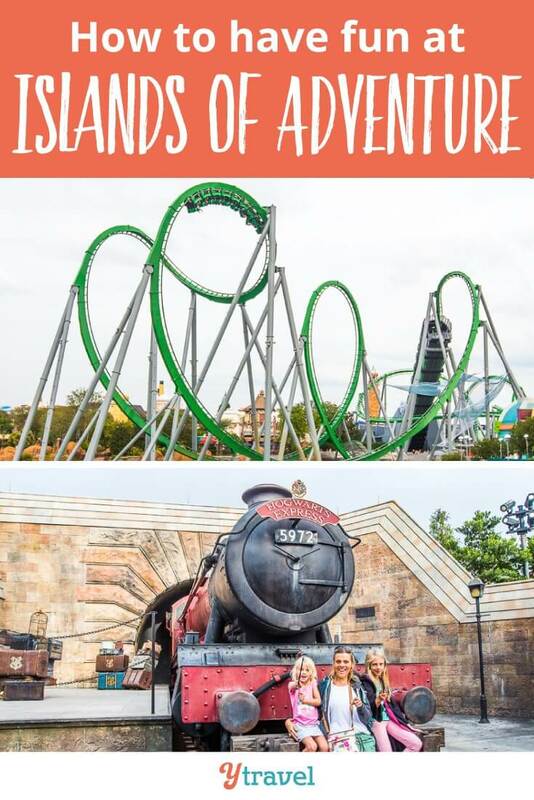 Personally, Islands of Adventure is my favourite theme park at Universal Orlando Resort. 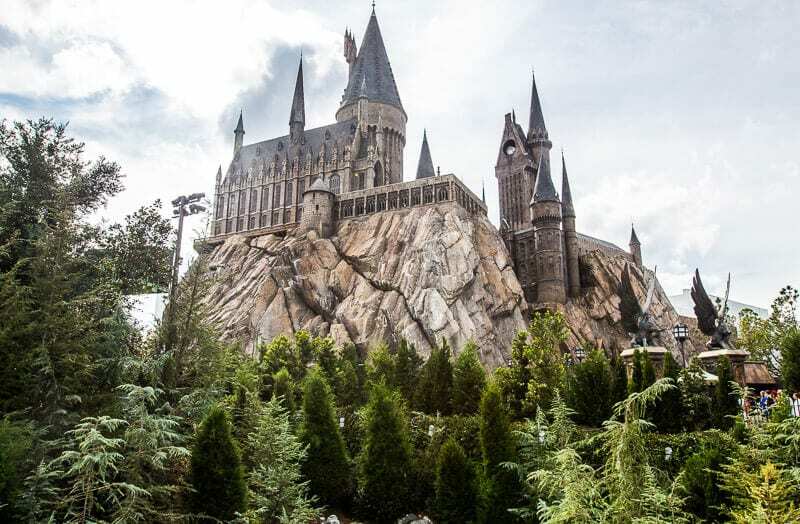 The incredible Wizarding World of Harry Potter is divided into two sections: Diagon Alley is in Universal Studios, while Hogsmeade and Hogwarts (my favourite section), is in Islands of Adventure. If you don’t want to do the long walk from park to park, you can ride the awesome Hogwarts Express between the two. 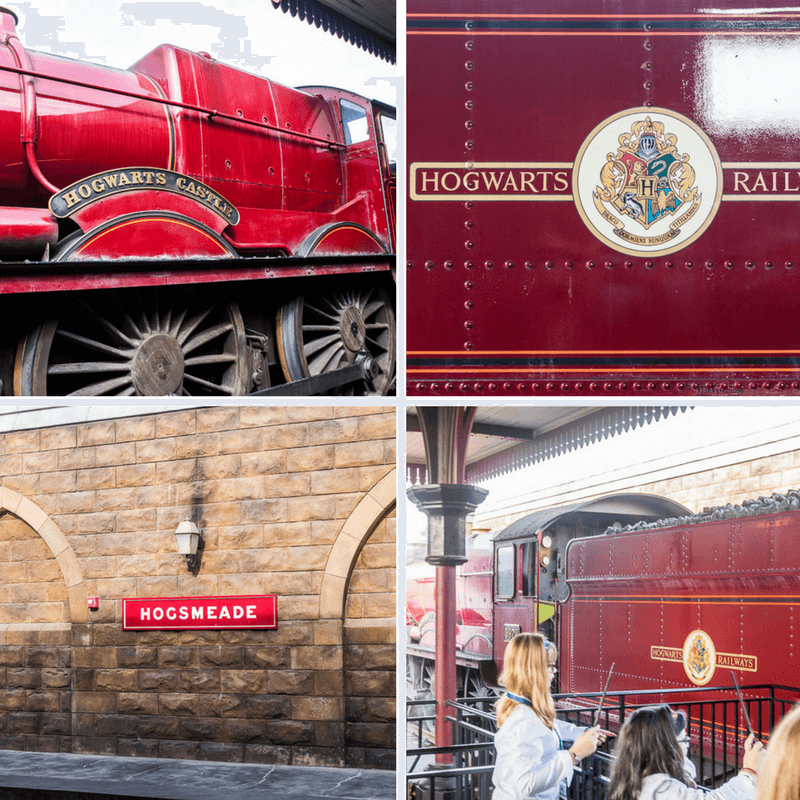 Why would you not want to take this magical train trip each time? It really feels like you are in the world of Harry Potter. Pay close attention to the windows, as there are 3D videos shown on the journey. What is so cool is the videos are different depending on what direction you are traveling. For example: if you leave Hogsmeade station, Hagrid is waving goodbye. If you leave Kings Cross, it looks like you are traveling from London to Hogwarts. The Hogwarts Castle is AMAZING (I was literally crying when I walked in lol). We had one-hour early entry passes because we were staying at Cabana Bay Orlando Resort, so Hogswarts Castle was the first thing we experienced in the Wizarding World of Harry Potter. Unfortunately it wasn’t the whole Hogwarts Castle because it would take up the entire park lol. The Harry Potter overture was playing, there was fake snow on the roof, and the castle rising up on the hill in the background. 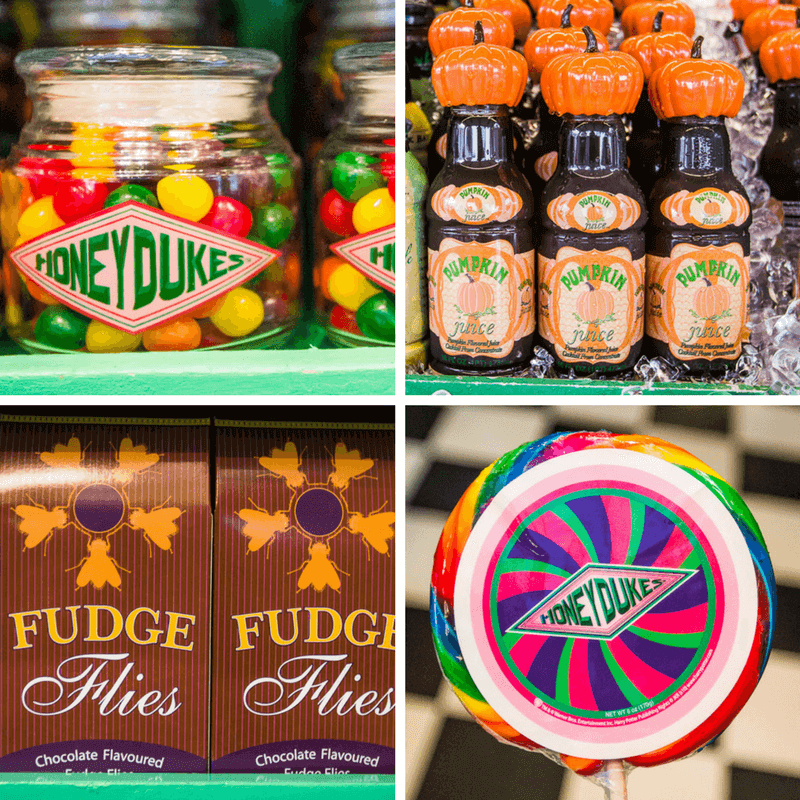 All the shops from the book are there like Honeydukes, Zonko’s, and so much more. 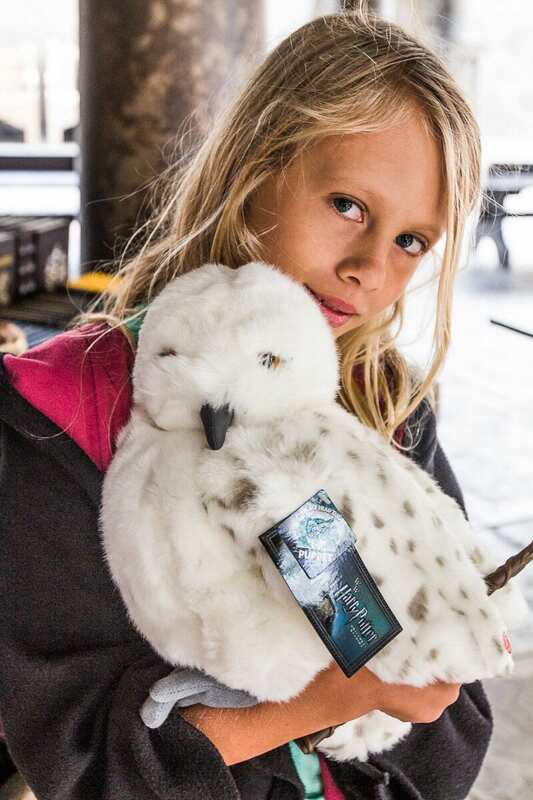 Universal puts so much detail into the wizarding world so it feels like you are in the books. I felt like I was in my dream world. I always thought it was silly when people cried at Disney World, but now I understand. I was overcome by the pure magic of Harry Potter and what J.K. Rowling was able to create. It was so joyful – Caz. 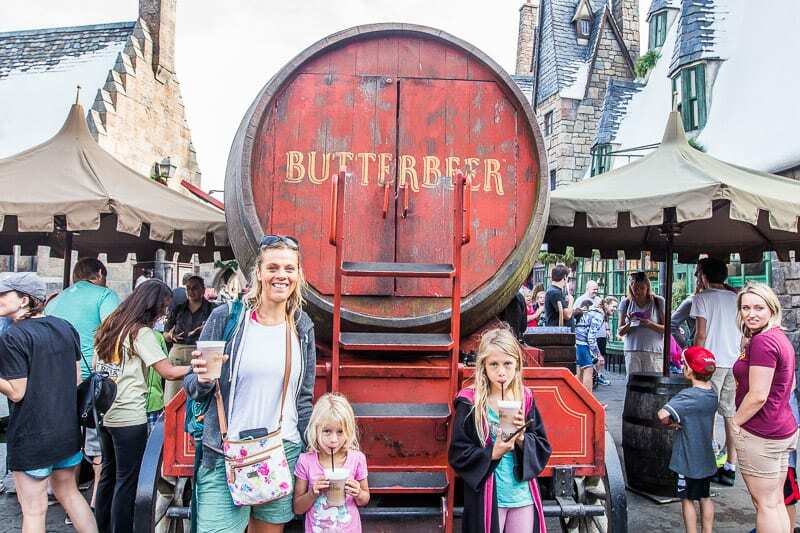 Ok, if you go to Harry Potter world, I DEFINITELY recommend Butterbeer. ( yes parents, it’s alcohol-free) OMG, it’s delicious!! I’ll never forget how excited Harry, Ron and Hermione were in the book to try butterbeer and how their first taste was the best thing they had ever tasted. That’s how we felt after our first taste. It’s like nothing you’ve ever tasted before and it’s incredibly delicious. 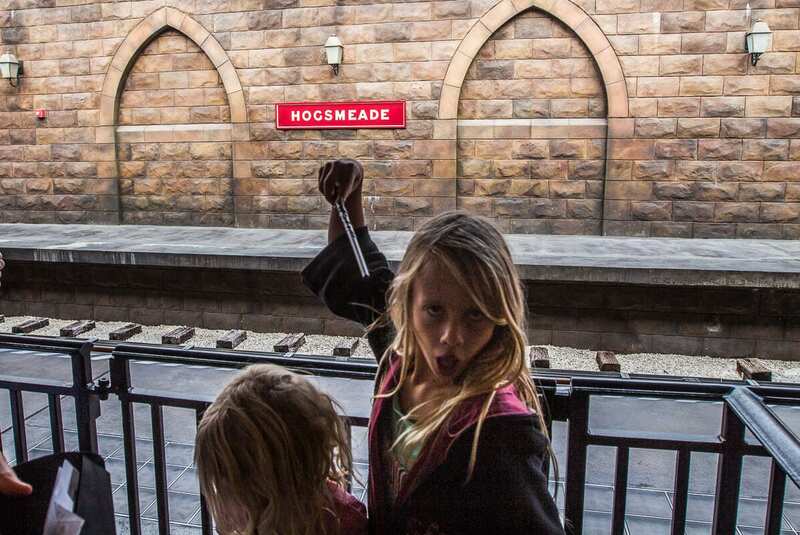 How they recreated that exact reaction from the book in real life is incredible. 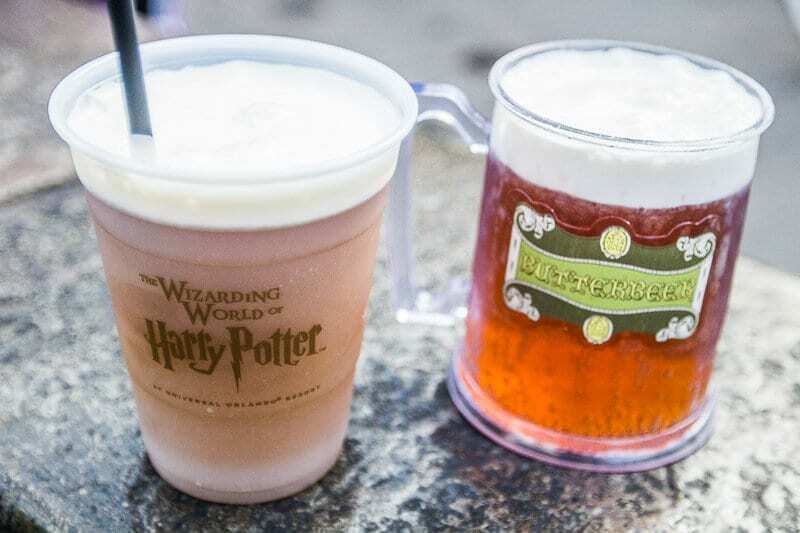 Butterbeer is like a creamy, butterscotch and creaming soda treat. 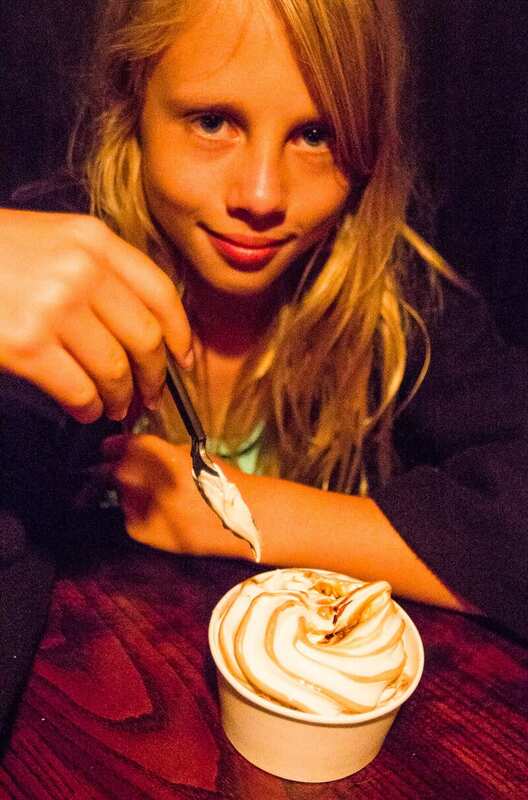 The marshmallow frothy top is divine. Cold ButterBeer (normal) where you can get it in Diagon Alley: Leaky Cauldron, The Hopping Pot. 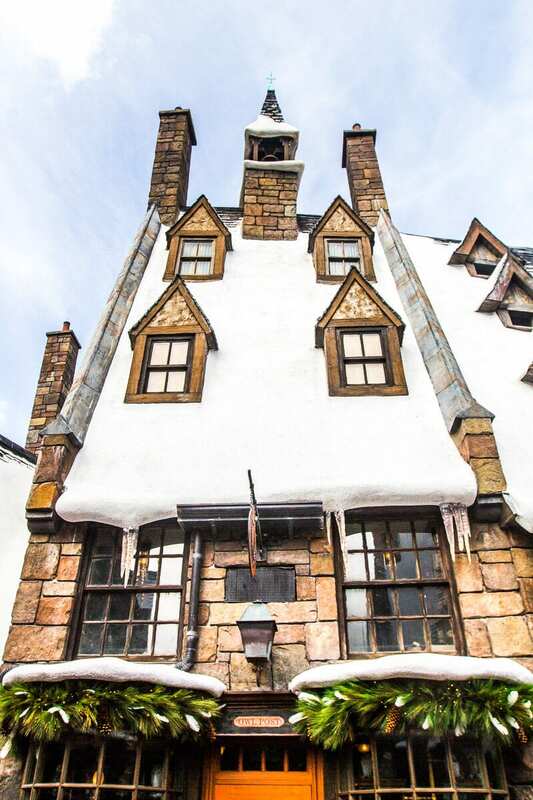 In Hogsmeade: Three Broomsticks, Hog’s Head Pub, and street carts. Frozen Butterbeer (like a slushie) You can get this item at the same places. (Mum’s favorite). 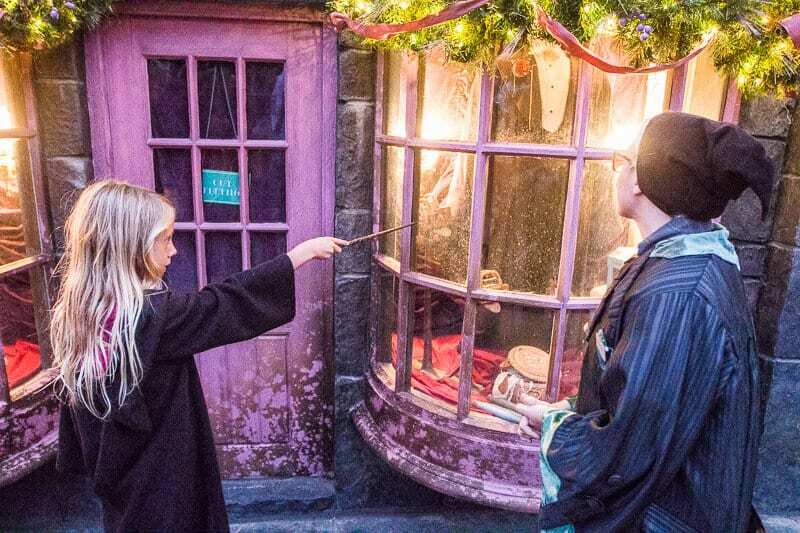 Butterbeer Fudge – In Diagon Alley: Sugarplum’s Sweet Shop Hogsmeade: Honeydukes. Unfortunately, we missed the fudge and potted cream- we didn’t know about them! Again, all of these items are non-alcoholic. 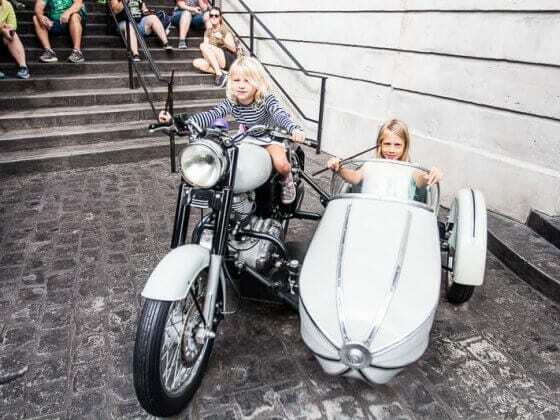 There are two rides at the Hogsmeade section of The Wizarding World of Harry Potter. 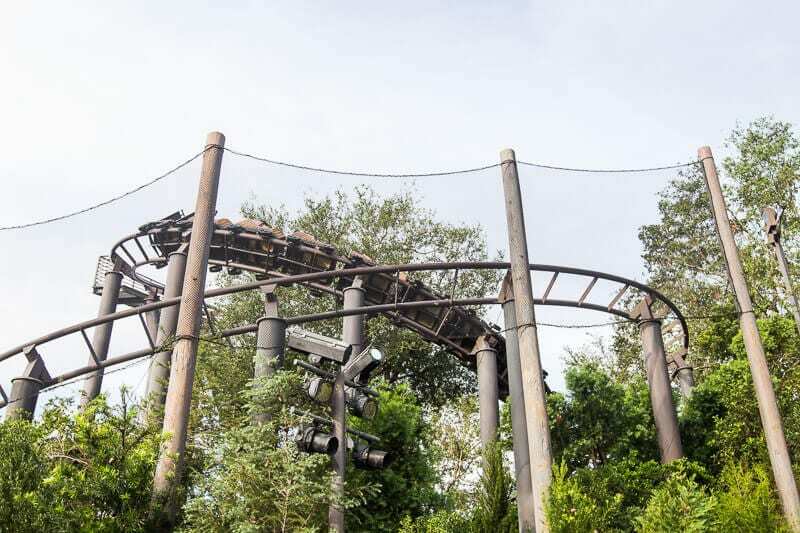 Flight of the Hippogriff is a great roller coaster for the younger kids. Although it’s a little wild for a beginner ride. Savannah loved this ride because she is a fan of Buckbeak in Harry Potter. I recommend this roller coaster ride for younger kids. Harry Potter and the Forbidden journey is one of my favourite rides ever, and one of the best rides at Islands of Adventure. This is a motion sickness ride and simulator so if you don’t like those kinda rides then I recommend not trying this ride. 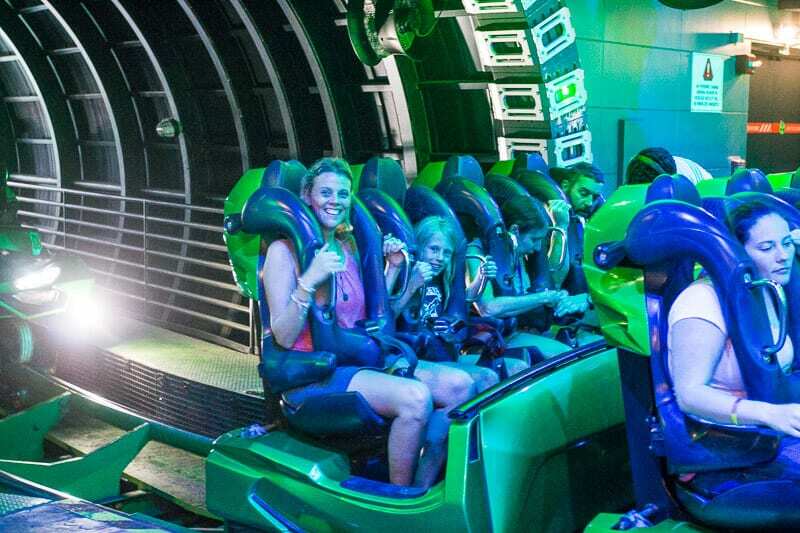 However, if you ARE fine with those kind of rides, then I DEFINITELY recommend this ride. It’s amazing because you go around inside the Hogwarts Castle through different rooms and even in the forbidden forest and on the Quidditch pitch where you can play Quidditch with Harry and Ron. When you first get on the journey, you can hear music and if you look up to a mirror, you can see Hermione talking to you. The only part I don’t like in this ride is the dragon part because the dragon blows hot air on you. The best part in my opinion is the Quidditch section and when the whomping willow is trying to attack you, and you sway to the side and it feels like you are about to go upside down because you also sway backwards. And if your thinking, no it’s not like normal simulator rides when your in a big movie theater. You actually sit in a vehicle (each one fits 4 people) going through the castle! Also, the queue is fantastic. I would the ride again just to go through the queue again. Since you’re in the Castle, the queue goes through rooms of the castle and it is absolutely amazing. Gryffindor common room, a hallway with picture’s talking and moving, and many more. The Forbidden Journey is just fantastic and I highly recommend it. 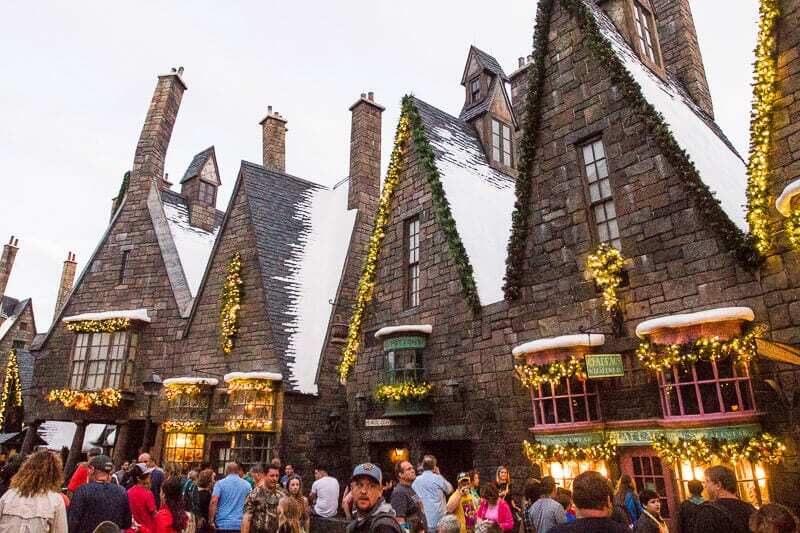 My experience at Hogsmeade was incredible. My dad was never really into Harry Potter but when we came here it inspired him to read the books. 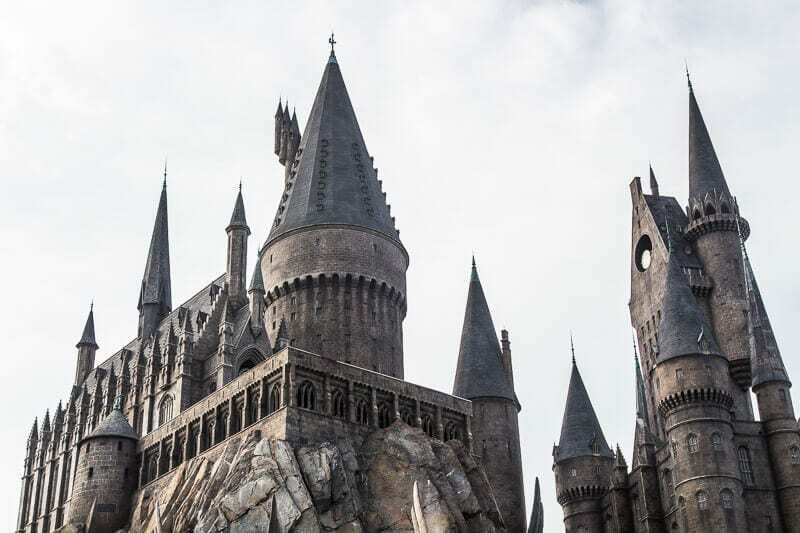 If you come to Universal Studios or Islands of adventure, you have to check the out The Wizarding World of Harry Potter! In Islands of Adventure, there are lots of different lands. There wasn’t really much to do in Jurassic Park, but it was still fun. The Jurassic Park River Adventure ride was fun though and one of our favorites. You think it’s relaxing until you do the big drop at the end! Savannah didn’t know it was coming, actually – nobody knew it was coming lol, except me because I watch videos of rides and stuff….. Anyway, it was so funny to see her face drop and let out a tiny scream! She’s not into scary rides and we convinced her to come on this saying it was just a gentle float down the river, which we thought it was!! She’ll never forget that ride. We didn’t spend too long in Toon Lagoon because there wasn’t much to do in this land. 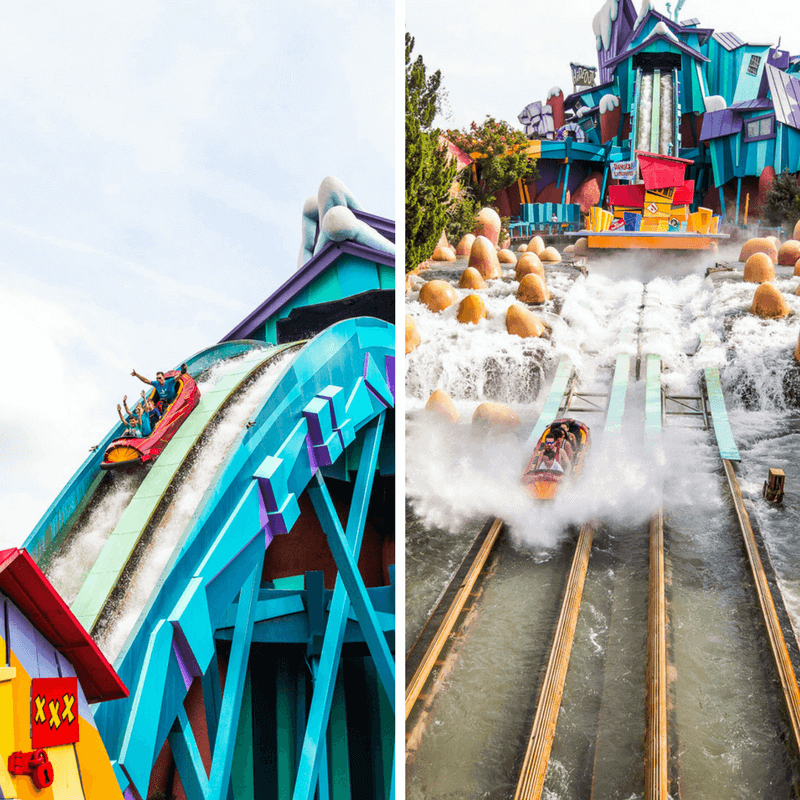 But there was really fun ride called Dudley Do – Rights Ripsaw Falls. 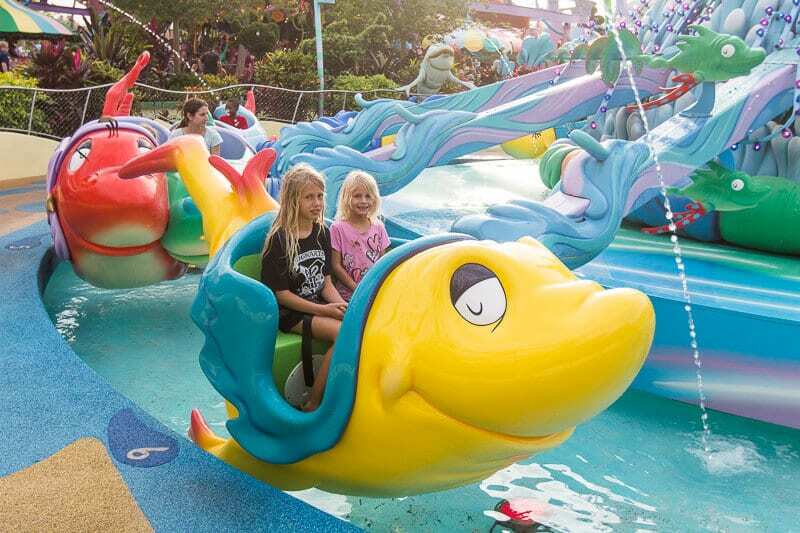 This ride is a water ride and you get soaked! Since there is child swap, (more information on that later) I got to go on it twice, so I got twice as wet lol! Oh, and it was really funny because there was a people dryer right next to the ride! Savannah really liked Seuss Landing because there was a couple of good little rides for her so we visited this land a couple of times. 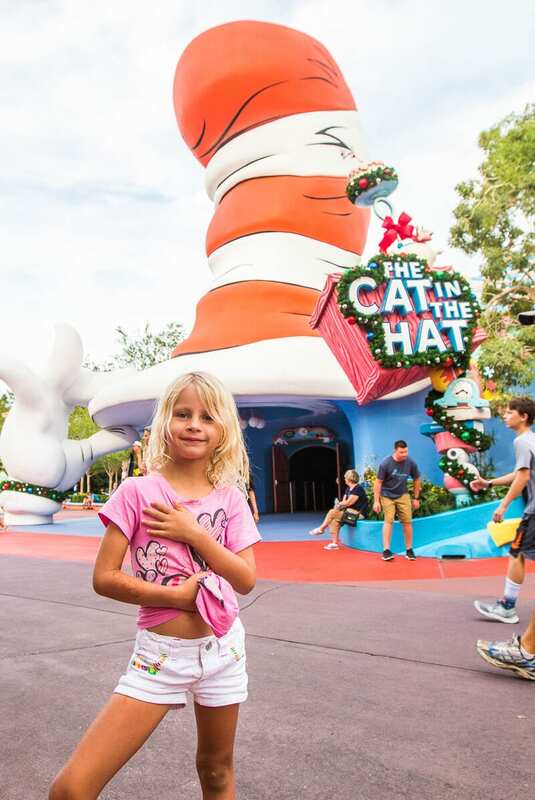 The Cat in the Hat – Savannah loved this ride! We didn’t do The Lost Continent, but it sure looked cool. Ok, so this is where the intense stuff begins. 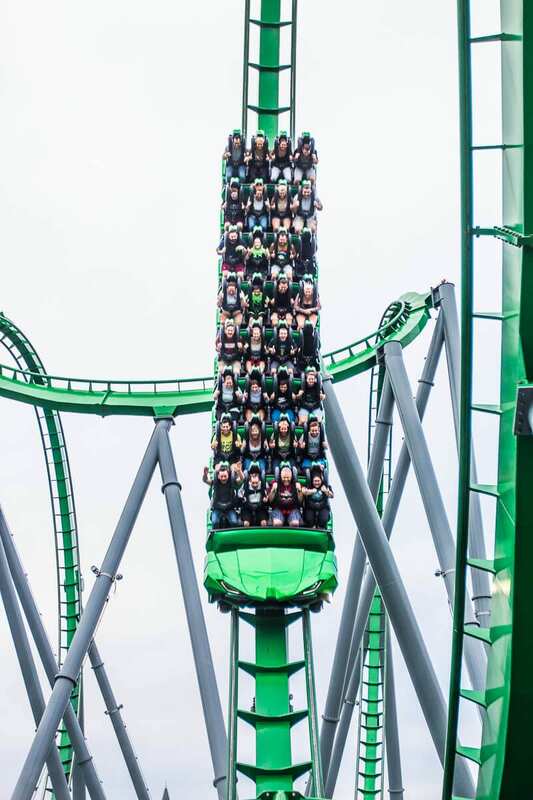 First of all, it is home to my favorite roller coaster, The Incredible Hulk. This is a launch coaster and it’s soooo much fun! The ride goes for what feels about 5 minutes, and honestly – at the end of it you just might be as green as the Hulk lol. It has 7 inversions and I love roller coasters that go upside down! I think it is one of the best roller coasters in Florida. Another fun ride I recommend, is The Amazing Adventures of Spider-Man. Spider-Man is another simulator and motion sickness ride when you sit in a vehicle. The best part is when all the villains attack you and you bump up and down and stuff lol. Universal’s Islands of Adventure was so much fun. I definitely recommend this park if you like Harry Potter, superheros, and stuff like that. I can’t wait to go back again! Mum put me in charge of planning a trip to Universal Orlando Resort. So I knew a lot of tips before going that would save us time and money. We learned a few more during our visit to Islands of adventure in the Universal Orlando Resort. 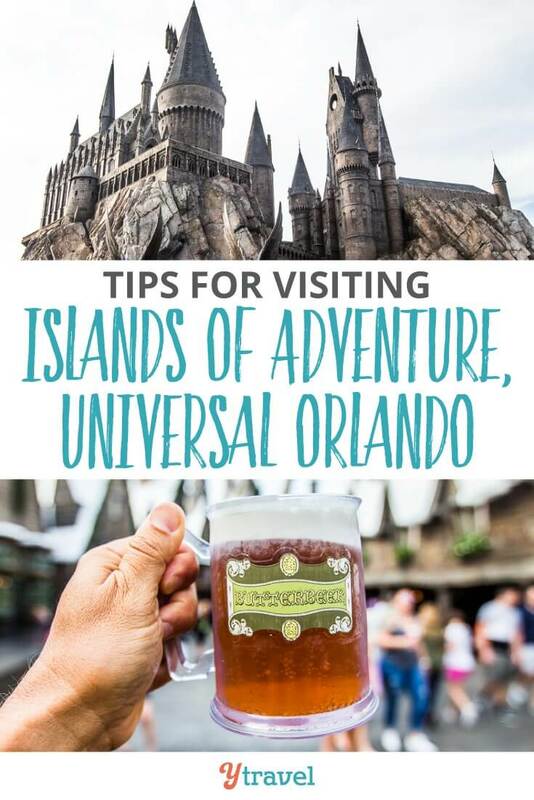 Dad has written an in-depth post sharing 18 tips for Universal Orlando Resort which will save you money and time. Here are just a few of my favorite tips. 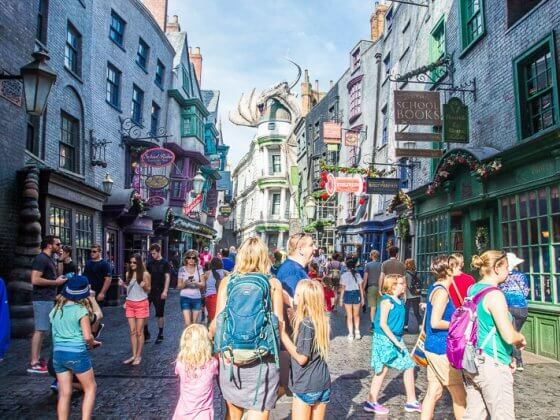 It’s best to hit The Wizarding World of Harry Potter either at 8 am (if you have early park admission by staying at an on-site hotel) or after 4 pm when the park clears out a bit. Check opening hours as sometimes the park may close an hour later. It closed an hour later than normal on the Friday night we visited. Head straight to the back of the park while people linger at the front taking photos and stopping at some of the attractions. If you stay on-site at certain hotels you get free Universal Express Passes to most rides and attractions, which allows you to skip to the front of the line. 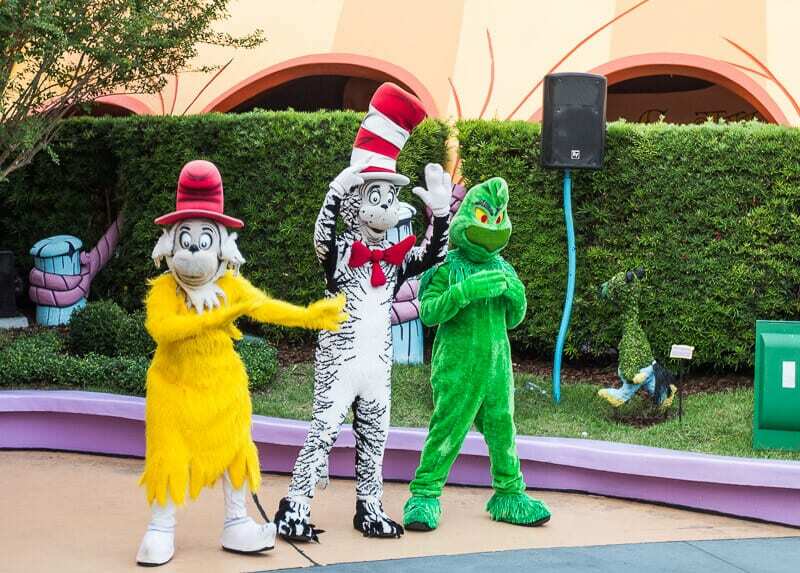 There are meet and greets with various characters throughout the day – including Seuss characters, Marvel Super Heroes and Spider-Man. 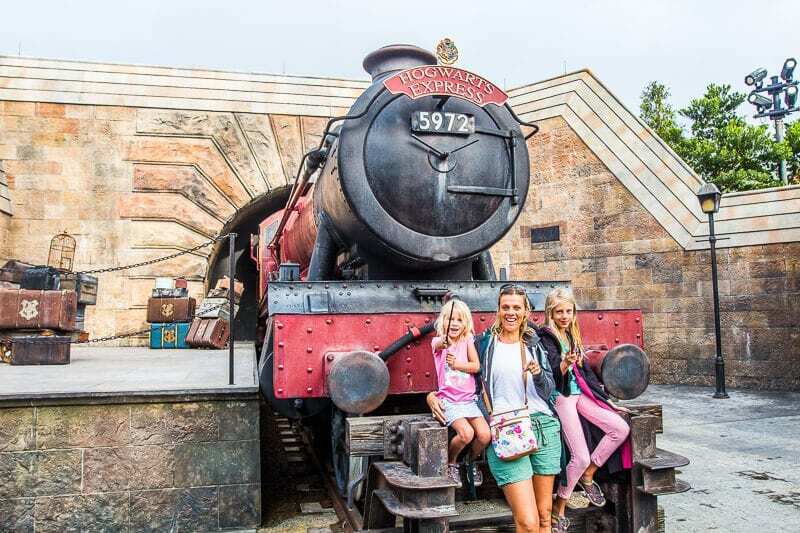 Purchase your Universal Orlando Resort tickets through our partner aResTravel, who can get the best priced tickets for Universal. Check for current deals. Staying on-site at Universal Orlando Resort helps a lot. It can get you into the park earlier (all resorts) and give you Universal Express passes (excluding Cabana Bay and Sapphire Falls). 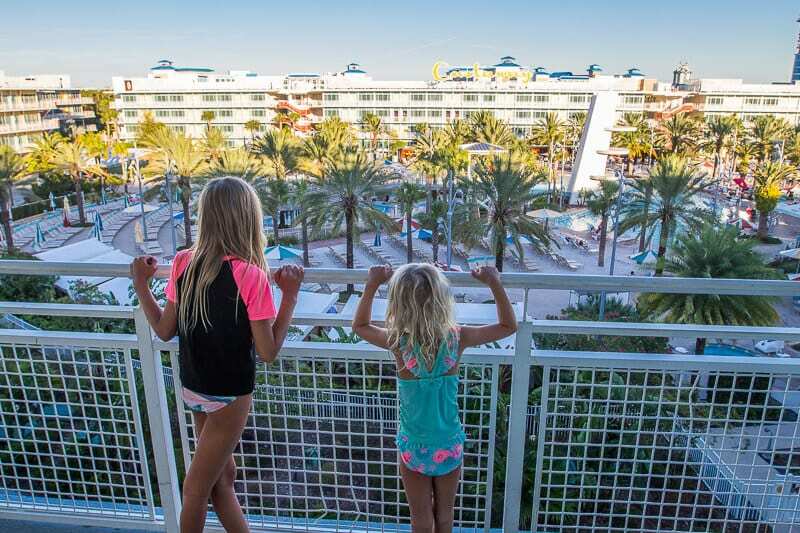 We stayed at Cabana Bay Beach Resort which is the closest hotel to Volcano Bay. I hope you like my post about Islands of Adventure as much as I did visiting the park. Next up I’m writing my post about Universal Studios. Stay tuned! Thanks for all those great tips ! We are planning to get to this place later this year. We already bookmarked your post. I understand you get free Express passes if you stay at certain resorts like Hard Rock but do you still have to purchase regular tickets to get into the parks? Or is the Express ticket your ticket to get into the park and get to the front of thenliney? 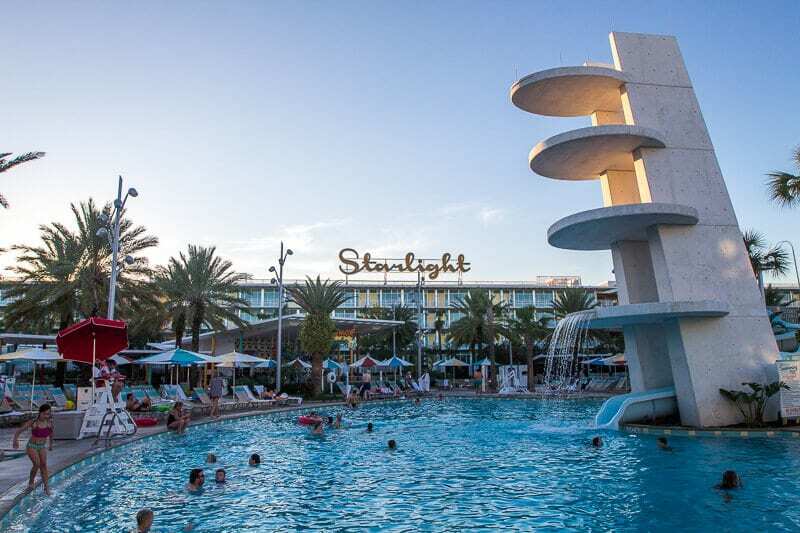 This looks amazing, I enjoyed reading your blog and a thorough review of the resort, the pictures are fantastic too. We have been to Orlando several times, it is our families favourite place to go. Just a word of warning there are loads of timeshare agents over there offering free gifts and park tickets to get you to a presentation. No-one ever warns people about this and its rife. We got into a serious financial problems because of it. We got out of it eventually through a company called mercantile but it was a nightmare and I would recommend anyone to stay clear of these sales rep’s. It hasn’t put us off Orlando altogether, but it did cause us a lot of stress, however these parks are just too much fun to miss out on. Wow makes me wanna go there right now. Anyways I like your blog, you give so much information and tips that are very helpful. Thank you!